Building wealth the sound way is done by recognizing some of the factors that makes the most impact to wealth building. A third factor that makes a lot of impact to your wealth is whether putting more to your wealth building, or chasing a higher rate of return. We can understand funding more to wealth building or chasing a higher rate of return is more meaningful. Suppose there are 2 person both earning $45,000 a year. 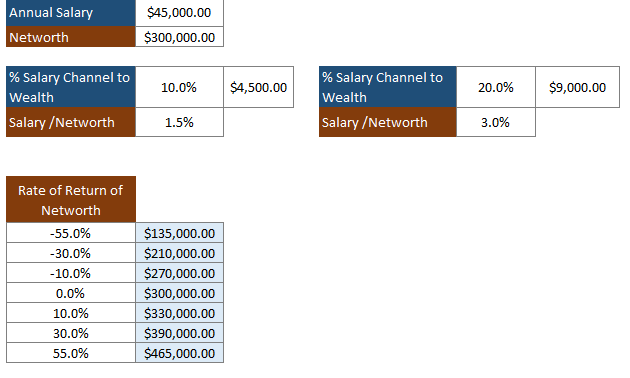 The first person channels 10% of his salary or $4,500 to wealth building, while the second person channels 20% of his salary or $9,000 to wealth building. The first guy, being more diligent, studious and adventurous, pushes his wealth building hard, average a rate of return of 15% per year, while the second person was gullible, was talked into purchasing an investment linked insurance, which average only 2% rate of return per year. The person who makes a 2%/yr rate of return is able to achieve a 10 year accumulation similar to one with a 15%/yr rate of return. You can liken this to an insurance agent with massive earning abilities versus an engineer who is also an astute wealth builder. 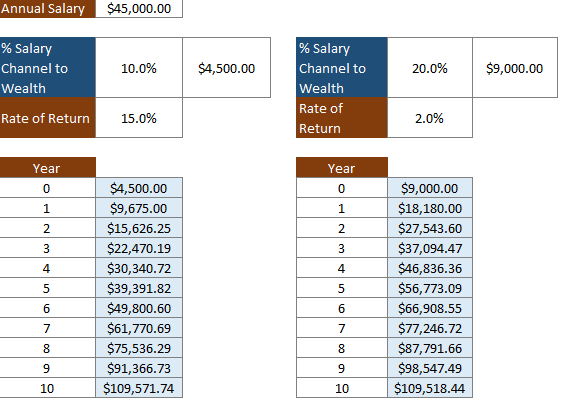 Over the next 10 years, the person with the 15% rate of return should be trouncing the person with 2% rate of return. As the result show, they are roughly similar at the end of 10 years with $109k. It turns out that channelling more to wealth building matters more when your wealth fund is small. Channeling 100% more to building wealth is like making a 100% return on capital by itself. The 2 person in the first part eventually build up $300,000 in their wealth fund. They hypothetically still earns $45,000 a year. When your wealth is built up to a substantial level, a substantial fall or rise in your rate of return for a year have great impact or catastrophic impact to your net worth. A -55% fall in a year will cut $300,000 to $135,000. It is difficult to make that back easily. A 30% boost to your portfolio, will see it grow from $300,000 to $390,000. That is equivalent to someone’s one year salary. Person A can still add $4,500 per year to his $300k and Person B can still add $9,000 per year to his $300k but their yearly wealth funding will hardly make a dent to their wealth fund. Doing this will result in a 1.5% and 3% increase in net worth respectively. Rather, their skills in building wealth matters more here. If a person does not have a fundamentally sound wealth building method, falling prey to some investment scams, he could see his net worth take a 55% draw down. His $300,000 may become $135,000. It will take many years of $4,500 or $9,000 to make up for not having adequate competency in wealth building. In contrast, if a person have taken effort and build up fundamentally sound wealth building abilities, the impact of a 10%, 30% or 55% growth in his net worth would make a much bigger impact than his annual funding to wealth building. A person needs to understand that when the net worth or portfolio is small, funding more to wealth building makes a bigger impact than chasing great returns. When the net worth or portfolio is substantial, sharpening wealth building competency or ensuring wealth building method is fundamentally sound matters more than funding wealth. 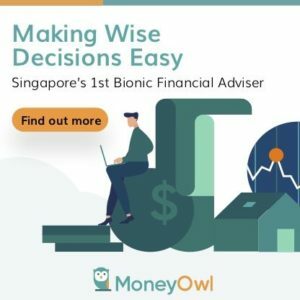 While having both is the best situation to be in, the common problem is that most expect that when they have $5,000 or $10,000 in spare cash , they think that putting the money in some stocks can turn this amount into a substantial net worth. That scenario is possible, but chances of more hurt and pain is likely. It also shows that by not building up wealth building competency, they overrate what unit trust, ETF and individual stock investing can achieve. Much higher success can be achieved by optimizing their spending, putting in effort to earn more, and channeling more to wealth building. And when we start building our wealth machine or portfolio, we may seldom think that we will eventually managed $200,000 to $1 million. A person needs experience, competency and temperament to make sure he or she grows this substantial sum prudently using fundamentally sound methods. Often, the person realizes overnight that they do not have adequate or ANY wealth building competency, so they delegate to insurance agents, financial planners, wealth managers that costs a bomb, whom they thought have their best interest at heart. Else they start listening to hearsay or prevailing wealth building fads to build wealth themselves. This is perhaps why investment courses are so popular as folks have accumulated enough and find that it is time they manage and grow their substantial wealth well. Experience, competency and temperament don’t get equipped overnight. They take place through much practice, reflections and fine tuning. Wealth building skills have to be built up, often when you have very little and when you think you least needed it. The simplest form is reading some fundamentally sound personal finance and investing books. I hope I have highlighted well funding substantially when your net worth is small matters more and it is crucial to have a good skillset in wealth building when your wealth fund is substantial. Even though you may find that you are contributing $100 per month to wealth building, not enough to purchase higher yielding and more risky assets, you have to spare some effort to improve your wealth building. Keep reading and keep learning. Waiting for when you need the skillset may be too late. 3) NO debts help you to save faster to accumulate capital for investment. 4) Use your saved capital to invest in the stock market judiciously. Still no 1 is the guiding light if you failed or succeeded in your route to FF. In this way, you shall have not much worries left in the rest of your life. Simple Uncle Temperament but you will find not many folks provide this to you. Some things are simple but not obvious. How would you change your methods of wealth building if you knew these when you were 24? Truthfully, more emphasis on career less goofing. I didn’t do too badly, but i could have done a lot better, especially as a single. I felt that I underachieved. I see. Thanks for sharing! No problem. We all have our mistakes. What good investment books will you recommend to a beginner? I am not sure if you are asking for wealth books or specifically active investment books. Foundation building books for me can be Millionaire Teacher by Andrew Hallam, Money, master the game by Anthony Robbins. In investing, Buffettology by Mary Buffett is simple enough for prospecting business. I’m very good on the skill part so I try to allocate as much as I can (~37%) on lower returns. Hi Azreal, what do you mean allocate on lower returns? Going mostly pure dividend play, dividend 4-5% returns? Can’t beat value or growth investing. So just save more I guess. ah i see. thanks for clarifying what you meant. What you says sounds reasoned but today i finally confirned after reading your article! No wonder so many people focused on earning more during their younger days. I’m today 31 years old, i think i should focused on my career and try to earn more so i can save more money. As putting aside more matters in early wealth building. What would you suggest to doing in a early career so that we can potentially earn more?